Our culture is intentional, and we value it deeply. We celebrate open and honest communication, hard work, creativity, cross-functional collaboration, high energy, good play, deep networking and acknowledging that we’ll each make mistakes and learn from them. We’re a local company made up of individuals who care about the people and places that surround us. 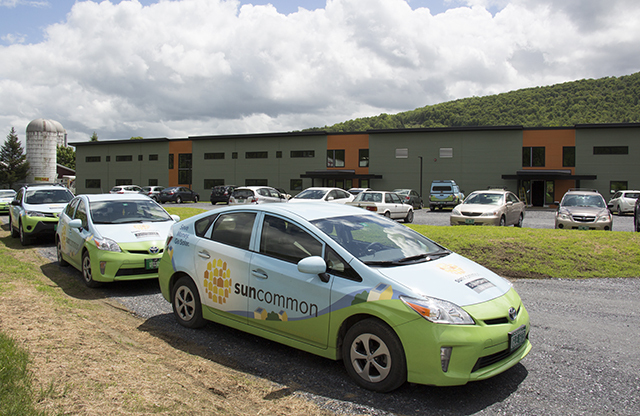 SunCommon® is a proud Certified BCorp (B Corporation) in Vermont and New York State, having passed a rigorous assessment of responsible business practices. We are also proud to be a Public Benefit Corporation, organized that way from the very beginning. That means it was our choice to be legally bound to put our employees, our communities and the habitat that sustains us all on equal footing with making a profit. We feel a huge responsibility to succeed – in order to honor our triple bottom line commitments to people (our co-owners/employees and their families, our customers and residents of the communities where we do business), planet (our proud roots and local stomping grounds in both Vermont and the Hudson Valley, and the broader globe, given climate change) and profit (providing capital to grow, revenue to empower and share among our employees and a reasonable return to our investors). Each of our team members has chosen the renewable energy industry because we recognize the work as meaningful – to our communities, our local economies, and our planet. We start from that shared purpose. Our staff works hard to help anyone in Vermont and New York’s Hudson Valley go solar. In order to support them in this endeavor, we offer a generous benefit package, which includes a competitive wage, comprehensive healthcare coverage, training and professional development, substantial vacation and health/wellness opportunities, and a culture that nourishes an energized and engaged workplace. 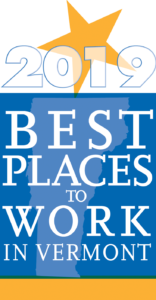 Our employees voted us among the Best Places to Work. Our employees are active in our community, and the communities in which they live. We love to participate in local Vermont and Hudson Valley events such as the Corporate Cup 5K, Green Up Day, Magic Hat’s Mardi Gras Parade and the WayToGo! Commuter Challenge, to name a few. At SunCommon, we believe everyone has the right to a healthy environment and brighter future – and renewable energy is the place to start. We’ve divested our employee retirements from dangerous and financially insecure fossil fuel investments. We also work hard to ensure our vendors and suppliers share many of our values-driven business practices and sentiment. We have an enormous capacity to use our business as a force for good, not just with programs around the edges, but even more so by directing the dollars that drive the core of our business toward businesses that share our values and help our communities thrive. Whether at our offices in Vermont or in Rhinebeck, we support other local businesses as much as possible. It matters where you come to work each day. In Waterbury, VT and Rhinebeck, NY, we’re proud of our net-POSITIVE office buildings. Our HQ in Waterbury is actually the largest net-positive building in Vermont. At our offices, we produce more energy than we use. 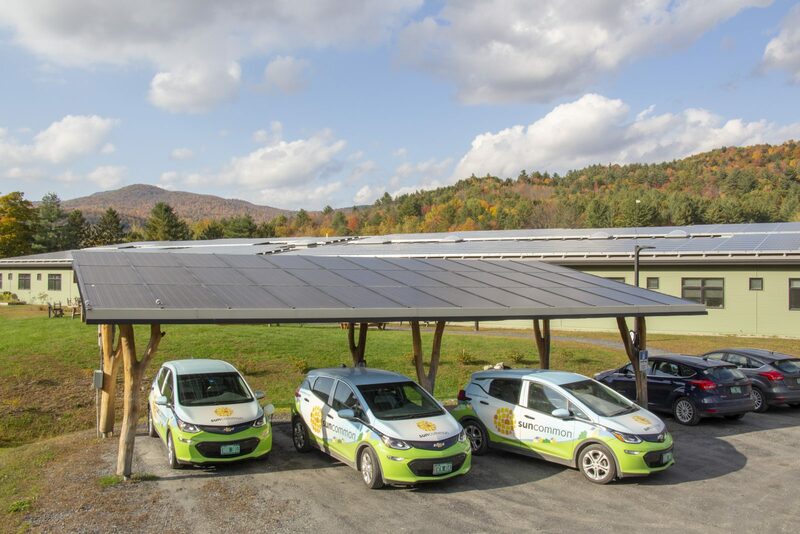 The extra energy in Vermont is shared out with local homes and businesses through our Community Solar program. A bunch of our SunCommon employees work in the field. 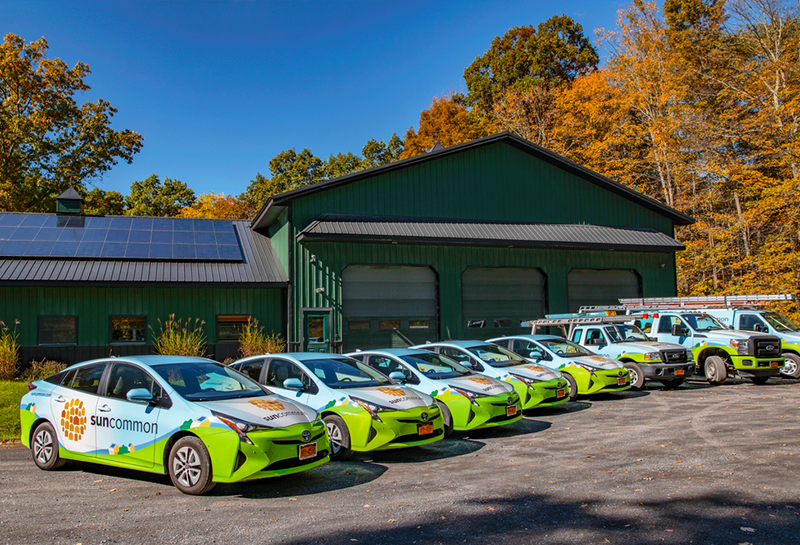 They drive hybrid gas-electric Toyota Priuses (although we prefer the plural Prii) and electric Chevy Bolts, powered by each location’s solar and wind systems, to show Vermonters and New Yorkers how to fuel cars off clean energy and say goodbye to gasoline.